We think the 1949 Chris-Craft 19 ft. Racing Runabout is our sleekest looking Chris-Craft to date. Our 1/8th scale version of this popular racer is 28 inches long with a 9 inch beam. 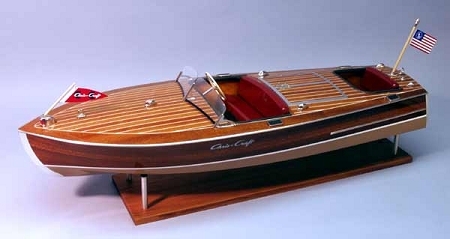 The wood framed hull is covered with expanded pvc and then planked with mahogany veneer. Like our other Chris-Crafts this kit features the finest materials including chrome plated dack fittings complete drive line hardware flag and burgee. Or make her RC with a two channel radio Dumas #2025 motor NiCad batteryand speed control. You will want to make the powerful Racing Runabout the next addition to you fleet.